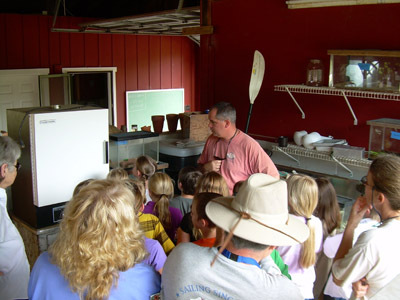 OSBS staff can provide interpretive nature-science based tours of the Station to public & private K-12 schools. These 2-3 hour tours will include traveling through the facility on a covered tour trailer and stopping to talk about aquatic systems, wildlife, habitat management, and the various research projects that are ongoing at OSBS. Due to limited staff time, visits are scheduled for Wednesdays and can accommodate one morning visit and one afternoon visit. Teachers wanting a class field trip to OSBS should contact the Associate Director to discuss their interests. There is no charge for field trips. Class sizes need to be no larger than 25-28. Liability waivers will need to be signed before the visit and provided to Station staff when you arrive. Students that may have allergic reactions to stinging & biting insects need to be identified to tour leaders before embarking. OSBS does not have food services onsite. Classes should be prepared to bring any food they may need. Water is available on the tour trailer.